Many investors consider insider buys — stock purchases by corporate executives — to be bullish indicators of a company’s future. 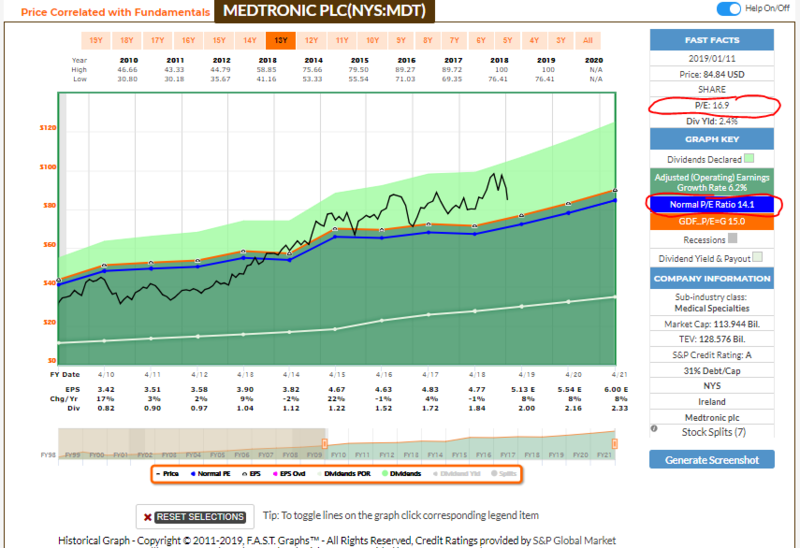 If so, things are really looking up for Medtronic (MDT). Earlier this month, CEO Omar Ishrak bought about $1 million worth of company stock, and CFO Karen Parkhill also shelled out big bucks for thousands of MDT shares. Although our transaction wasn’t quite that large, the medical device company has become the 22nd component of DTA’s Income Builder Portfolio. On Tuesday, Jan. 15, I executed a purchase order on Daily Trade Alert’s behalf for 12 shares of MDT at $86.49 apiece. Executives have access to the most detailed information available about their companies, and they are experts on their industries. So if they are buying oodles of their stock, common sense dictates that regular investors also should, right? Well, I’m not big on “universal truths” in investing. Sometimes, CEOs and other upper management types acquire shares of their corporations hoping to boost investor confidence … only to have the stock price continue to plummet. On Sept. 23, 2014, Seadrill’s chairman, John Fredriksen, bought 2 million shares of his beleaguered oil-rig firm’s stock at roughly $28 apiece. 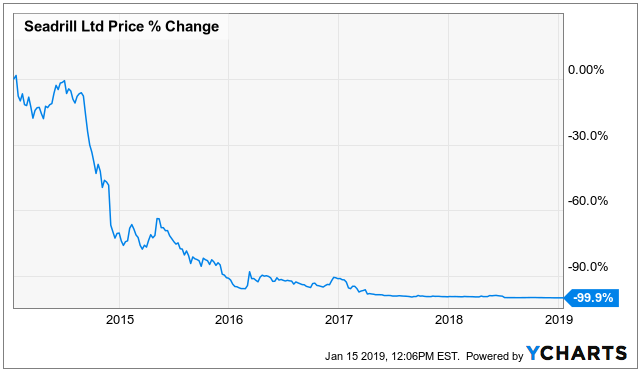 It wasn’t long before it was a penny stock, and the company filed for bankruptcy in 2017. How did that insider buy work for investors? While SDRL seems like an extreme example, it’s not as rare as one might think for stock prices to decline significantly after insider buys. Management might not be the most objective investors, either. When making projections about their companies’ futures, they might see what they want to see or hope to see. For those reasons and more, the quality of a business — as measured by fundamentals, history, economic moat, industry strength, etc. — matters far more to me than insider trading does. 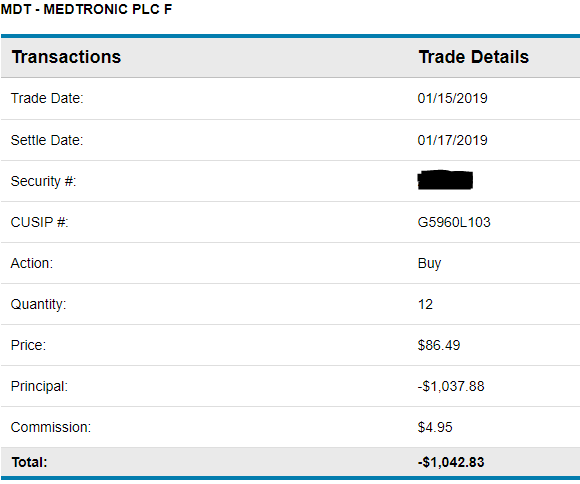 Still, the fact that Medtronic executives have been aggressively buying company stock was one of a multitude of factors in MDT’s favor as I considered potential choices for the Income Builder Portfolio. In my previous article, I detailed some reasons I like MDT. 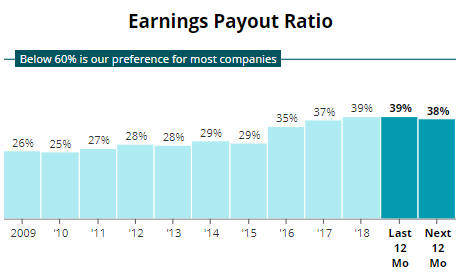 High on the list: a dividend that has been increased annually for 41 consecutive years and that is easily covered by the company’s free cash flow and earnings. Thanks to a 9% dividend hike last summer to 50 cents, the IBP’s 12 shares of MDT will generate $6 in income come mid-April. Then, before its July distribution, Medtronic is expected to announce another raise. If that’s also 9%, to 54.5 cents, it would result in a $6.54 payout. That probably is because Medtronic is from Ireland, though I will look into it more. Nevertheless, those dividends will be “reinvested”; I simply will use them toward purchase of another stock down the line. So either way, we will be building our income stream — just as this portfolio’s name promises. Medtronic has established tax residence in Ireland, and as such … Irish dividend withholding tax (DWT) rules apply. … Payments will be subject to an Irish withholding tax of 20% of the amount of each dividend unless the shareholder that is beneficially entitled to the dividend is a resident of the United States or a resident of a country listed as a “relevant territory” … With these rules, the vast majority of Medtronic shareholders and beneficial owners are entitled to an exemption from DWT. In other words, if you live in the United States or another country that has a “tax treaty” with Ireland, you don’t have to worry about the dividend withholding tax — which is the case with the IBP. If you are from a country other than America and you are considering MDT as an investment, you need to research whether your dividends will be subject to the tax. My editors, who provide the $2,000/month for me to invest on their behalf, expressly told me they did not want to own companies that faced withholding taxes in the Income Builder Portfolio. As the following graphic indicates, the 10 analytical firms surveyed by Thomson Reuters are very high on Medtronic’s prospects. 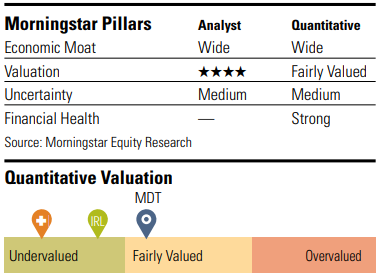 Morningstar’s analysts say MDT is worth $110 per share, suggesting the price the IBP paid is about a 22% discount to fair value. 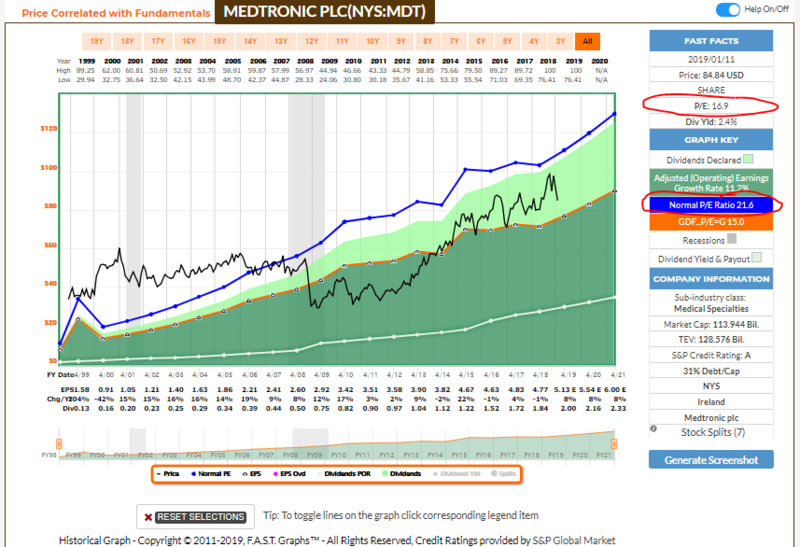 CFRA gives Medtronic a 12-month target price of $104. 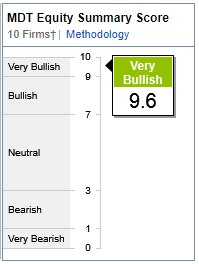 Only about 10% of the stocks Schwab covers get an A for expected performance. Medtronic is among them. Value Line includes Medtronic in its model portfolio of “Stocks With Above-Average Year-Ahead Price Potential,” because the analyst believes MDT’s price can appreciate 30% to 60% over the next 3-5 years (blue circled area of graphic below). Value Line also assigns a “Relative P/E ratio” of 0.87 (red circle), well below the 1.00 it considers fair value. Additionally, MDT gets VL’s highest scores for Timeliness, Safety and Financial Strength. 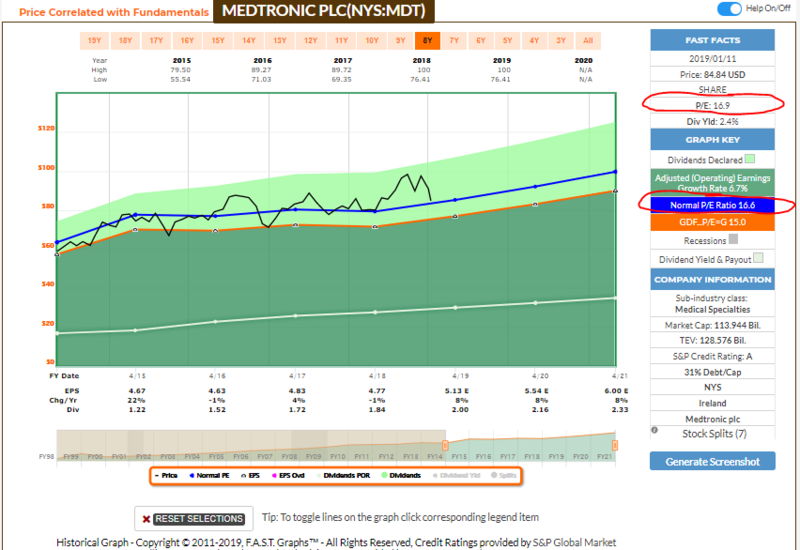 The FAST Graphs fundamental research tool shows that Medtronic is undervalued … or overvalued … or fairly valued. Huh? Well, it depends upon the time frame one looks at. Going back 20 years, as the following graphic does, the current “Blended P/E” of 16.9 is considerably lower than the 21.6 norm, suggesting significant undervaluation. However, if one views the 10-year period since the Great Recession, the normal P/E ratio was 14.1, suggesting pretty significant overvaluation. Finally, checking out the most recent 5-year stretch, MDT seems fairly valued. Well, this investor looks at all of the available information — from Morningstar’s $110 fair value estimate, to Schwab’s “A” rating, to Value Line’s .87 Relative P/E ratio, to the FAST Graphs information, to a forward P/E ratio of about 15, to a 1.6 PEG ratio — and I see a company that appears attractively valued given the quality of its business. With sky-high income growth and market-beating total return, our Income Builder Portfolio had a wonderful first year. Can Year 2 be as successful? Although we’re still almost 12 months away from knowing the answer to that question, it’s nice to get 2019 going with our purchase of the outstanding business that is Medtronic. On Saturday, Jan. 19, we expect to publish an article about my IBP “watch list,” detailing many of the companies we will consider adding to the portfolio as the year goes on.